The lawyer acting for French Polynesia’s first imam [Hishan el-Barkani, pictured] says he has been given death threats over last week’s brief opening of Tahiti’s first mosque. The city administration of Papeete shut the prayer room a day after it opened, saying the premises failed to meet safety standards for public meetings and could only be used as office space. The news about the mosque caused an uproar, with the A Tia Porinetia political party warning against the risk of extremism while the government restated the constitutional right to freedom of assembly and religion. 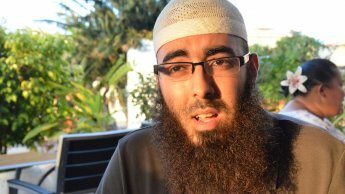 The issue triggered a debate in the assembly, with a member of the ruling majority and deputy mayor of Papeete, Charles Fong Loi, saying the 23-year-old imam has a provocative attitude and fails to give proof of intellectual honesty. One anti-independence member said while he wants to keep the traditional hospitality, it cannot be extended to anything and anyone in the name of secularism. Addressing his pro-French rivals, the pro-independence opposition leader, Oscar Temaru, said by coming to Tahiti the imam simply travelled within France, and in France there are mosques. This entry was posted in Anti-Muslim violence, France by Bob Pitt. Bookmark the permalink.